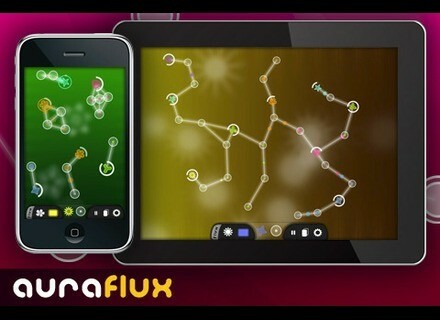 Aura Flux, Other software for iPhone / iPod Touch / iPad from Hige Five. 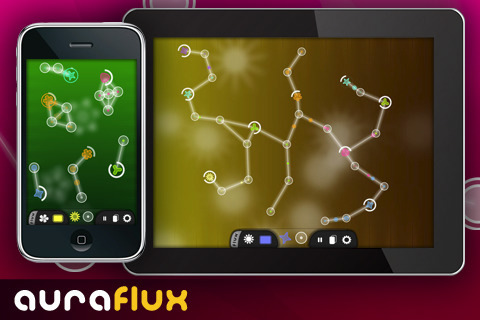 Aura Flux is a new way of making non-grid based, organic music, specifically tailored for iOS devices. With 48 Instruments, 4 Seasons (keys) to choose from and a constantly evolving background ambience, Aura Flux makes for "endless music creation possibilities," the company assures. Chains of notes are created by visually connecting nodes using the multi-touch interface. These nodes can be customised by setting the pitch, trigger rate, volume, decay and adding additional ‘chord’ notes. By layering these chain reactions together the user can produce ambient melodies and with the option to randomise many of the settings can introduce elements of generative music into their creations. As with the first Aura, the keys are locked to certain intervals so that it's impossible to create harsh dissonance or unpleasant-sounding harmonies, according to the company – you can choose from a range of these keys (or ‘Seasons’) ranging from Mixolydian to more minor sounding modes. To compliment the melodies being produced by the interacting nodes, there are a number of background ambience pads that serve to knit together a more coherent piece. Aura Flux is a Universal App, so will work on all iOS devices with one purchase. WOK SimpArp WOK has released SimpArp, a free MIDI-Arpeggiator VST plug-in for Windows. Brainworx bx_XL bx_XL is a low latency M/S mastering limiter whose main purpose is to help you get your mixes loud and clear.